Laughter is an amazing thing, it releases energy, improves your mood, relieves stress and helps to reset your body chemistry. Even pretending to laugh can show some of the positive effects of laughter, because the physical connection to our mental and emotional state is so strong. Shared laughter builds a shared emotional state (plus it's fun). Fair warning, talking about humor automatically makes it less funny, sorry, that's just the way it is. You will have differences in your humor, that's to be expected. One of you might love slapstick and clowns while the other loves the wordplay of Dennis Miller (while neither of those options sounds funny to me in the least). Enjoy your differences, experience them and appreciate them, but don't dwell on them when you're together. When you sit down together, find the things that make you both laugh. It might be a rousing game of Pictionary that set you both to giggling like school-girls or you might be thrilled by Prairie Home Companion on NPR. Experiment to see what sets you both to laughing, be it episodes of Arrested Development or Fawlty Towers. 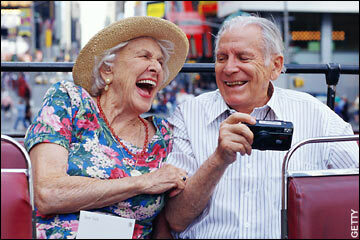 Find time to laugh together and the rest of your relationship will feel better too. What gets you to laughing? What about your spouse?